Facebook is an enormous advertising platform with an audience of more than 2.23 billion users. But if you’re a B2B marketer, your focus must be narrow and precise to reach the Facebook users that matter for your campaign objectives. Through a partnership between HG Data and LiveRamp, you can now use HG Data Audience segments to target your ads to the most relevant audience on Facebook in just a few quick steps. Account selection is one of the most critical components to ensuring ABM success. It determines how specific you can get with your initial outreach, the type of content you produce, and the overall effectiveness of your program. To deliver the best results, you need a data enrichment strategy to help you select the right accounts for your ABM program. Register for this webinar today to learn how you can use third-party enrichment data to select the accounts that ultimately lead to larger deal sizes, faster sales cycles and more revenue for your business. - Improved Prospect Selection that keeps sales teams focused on the right opportunities. - Increased Sales Pipeline that grows your total available market from 3-5x. Register for this webinar today and learn how to leverage technographics to drive more successful outcomes for your sales and marketing teams! If you sell or market a B2B technology product or service, you’re accustomed to developing call scripts or marketing collateral that highlights how you solve the pain points of a competing technology, or enhance the functionality of a complementary solution. However, all the work you’ve invested in crafting that refined message gets lost if you’re not delivering it to the people that would benefit from your offering the most. - How Tegile, a Western Digital brand, is using technographic data to deliver personalized content for their ABM programs, develop custom product pitches for their SDRs, choose the right channel partners their accounts, and conduct strategic target market assessments. Here's a quick example of how you can use technographics to score your account within Salesforce. Account scoring helps you prioritize and route your accounts so your sales and marketing teams can target the right accounts in their outreach. You’ve heard all benefits of account based sales development: better alignment between sales and marketing, increased engagement with target accounts, and larger deal sizes leading to higher revenues. That’s great, who wouldn’t want that? But how do you get there? The presenters for this webinar are Barbara Winters, Vice President of Marketing at HG Data, and Justin Kitagawa, Director of Sales and Marketing Technology at HG Data. SiriusDecisions recently introduced the new Demand Unit Waterfall, a process that enables teams to track their lead flow, improve their processes and, ultimately, drive increased revenue and growth. Quality third-party data is a key driver in implementing a successful Demand Unit Waterfall in your organization, but exactly what data should you be looking for and how do you apply it? HG Data is the best-in-class leader for technology installation information in the world. B2B technology marketers rely on our accurate technographic insights, based on advanced data science, to build better forecasts and precisely target their campaigns at scale, while innovative OEMs use our intelligence to enhance their product offerings. The sales and marketing teams who run the most successful cross-sell/up-sell and competitive takeaway campaigns do so my learning all they can about the technology their prospects use to run their business. This allows them to craft highly tailored messages that directly address the pain points prospects are having with their current tech stack, in a language that resonates and encourages follow up. The presenter for this webinar is Mark Godley, the chief revenue officer for HG Data. Mark has held leadership positions at technology companies of all sizes, from pre-revenue to publicly traded. Mark is best known for driving revenue that significantly outpaces industry growth while rejecting the herd mentality. 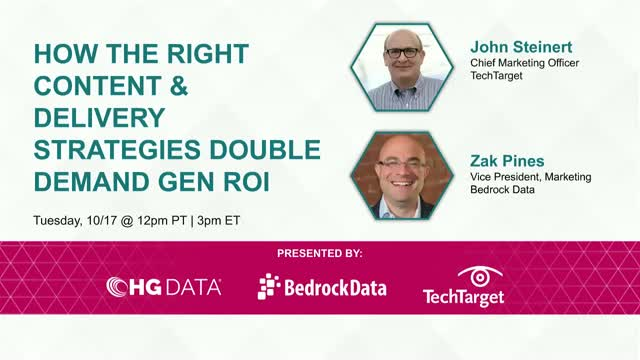 Moderated by John Donlon, research director at SiriusDecisions, and featuring presentations by Mark Godley, CRO of HG Data, and Vin Turk, COO of Madison Logic, this webinar demonstrates the type of data you need to succeed in your programs. Vin and Mark will also share use cases as to how data is helping them deliver extraordinary results in real-world ABM programs. Spend more time selling and less time searching. This webinar will address how to expand your market, sharpen your focus, and implement a data-driven approach to account-based marketing sales strategies. This channel will show you how you can leverage comprehensive technographics from HG Data to improve the way you segment markets, refine messages and offers, direct ABM (account-based marketing) initiatives, and feed business intelligence systems for optimal results. HG Data is the best-in-class leader for technology installation information in the world. Today, leading B2B technology providers – from Fortune 500 to fast-growing start-ups – rely on technographic insights from HG Data to achieve better results from their marketing and sales programs.